Detail for traveling allowance for RSTH Examination. RSTH RSTH AdmitCard, Taluka-District head worksheet, Permission Letter,Worksheet. 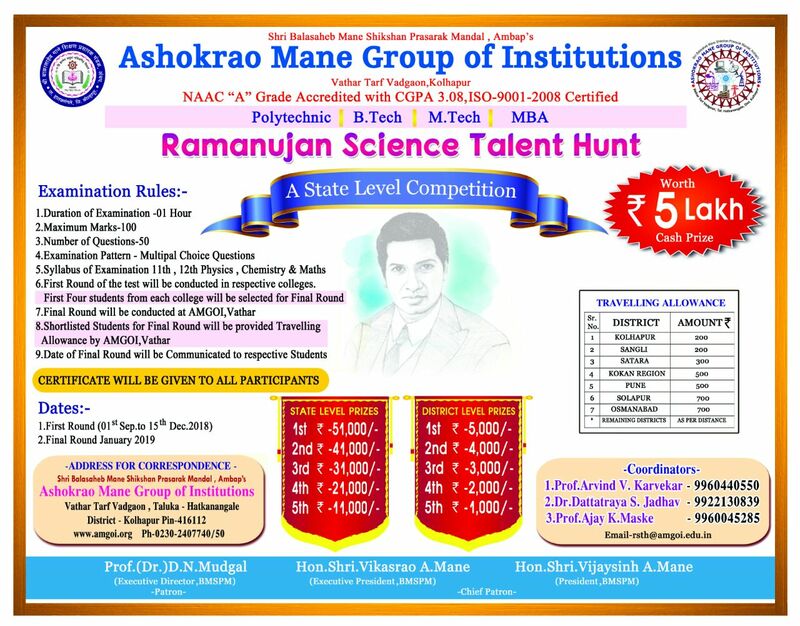 AMGOI organized "Ramanujan Science Talent Hunt" for 12th science students. We at AMGOI, are committed to impart quality technical education and managerial skills with active involvement of all stakeholders and strive hard for our students’ satisfaction by continual improvement and systematic approach. Shri Balasaheb Mane Shikshan Prasarak Mandal , Ambap was established in the year 1980 by Late Shri Ashokrao Pandurang Mane, Founder and President, with the aim of promoting education in Southern part of Maharashtra State. The journey to spread education was started with a secondary school in the year 1980. Shri Balasaheb Mane Shikshan Prasarak Mandal, now runs 29 Institutions comprising of Schools, Teachers Education, Agriculture, Pharmacy, Polytechnic, Engineering and Management Studies.